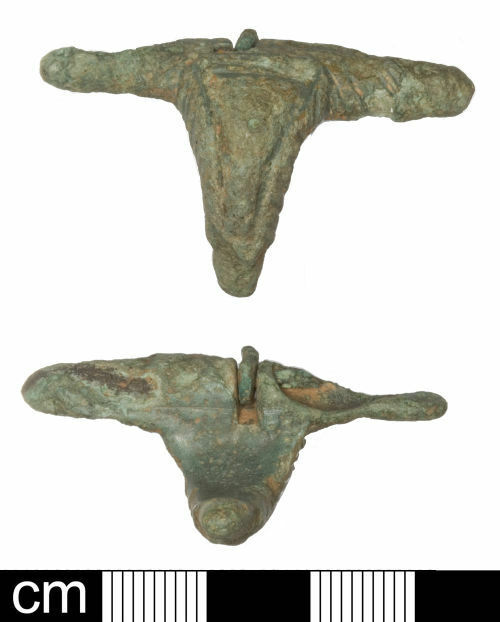 An incomplete Roman copper-alloy initial T-shaped brooch, missing the majority of its bow and pin, and also the leg with catch-plate. The brooch consists of heavily abraded cylindrical wings, upper bow and the head of the pin. Both wings are abraded at their tips, with one having lost most of its underside. There is possible incised diagonal decoration on the upper surface of the other wing, though this is not clear. The remnant of the circular-section copper alloy axis bar is visible at the broken wing, it is itself truncated. Between the wings is a slot in which the remnants of the pin are hinged. The pin has a pointed spur at its head to aid hinging. It narrows to a circular cross-section but is broken immediately beyond the head. The bow projects from the front of the brooch in the centre of the head, intially at about 45 degrees before curving round and gradually travelling downwards. It tapers in width towards an old break. It is flat at the head and 'humped' just behind. The bow is 'D'-shaped in section with a flat back and convex front. The upper surface has a triangular moulding at the front of the bow, just above the slot. This is delinated by grooves along its sides, with incised diagonal lines below, along the sides of the bow, giving a reeded effect. The bow continues to narrow below and is abraded thus obscuring any decoration. The transverse break below is old and patinated. Bayley and Butcher (2004, 158) illustrate a broadly similar example, T137, with a plainer bow.. They suggest (ibid., 159) 'Initial T-shaped' brooches to be 'usually hinged, not enamelled but sometimes with fine relief decoration and lacking a head loop', dated to the Flavian period (AD 69-96) or earlier. This example also has parallels to hinged dolphin variant 4, though this type is mainly known from the Midlands. This brooch has a dark-green patina with some patches of light-green corrosion product.